One of the joys of reading a series of books is to see the characters grow and change, all within certain limits, so that a sense of familiarity lets us feel comfortable. There's nothing wrong with "comfort reading." Within its so-called confines, one can find challenging and invigorating stories, new perspectives on one's own life and yes, simple pleasure. When you open up an Ian Rutledge novel by the writing team of Charles Todd, you have a decent idea of what you're going to find; a solid story, a historical setting, an organic sense of suspense and some nicely-turned observations of war and its echoes. Credit the writers then, for turning everything upside-down with the latest entry in the series, 'A Fine Summer's Day,' a prequel set before the First World War. Knowing what is to come makes finding out what will happen all the more enjoyable. 'A Fine Summer's Day' begins with shots fired, including one heard 'round the world. We meet a very different Ian Rutledge. He's smart, yes, but as yet unfazed by life. He's engaged to Jean, the beautiful blonde who, as we meet and get to know her, seems far too shallow for the man Rutledge is destined to become. Rutledge is tasked by the always-odious Bowles with solving a string of murders all about England. It's just the kind of case we like to see, but Rutledge's — and England's — minds are elsewhere. Marriage and war loom large. With 'A Fine Summer's Day,' the writers are just as interested in capturing the fever for the war to come as they are in apprehending the villain, and they do a spectacular job at crafting this atmosphere in the background. We don't hear what we now know about the war. Instead, Rutledge, when he's not trying to make it to parties peopled by the vapid over-class he's hoping to enter, is immersed in pro-war propaganda. It's chilling to read both because we know what it means to the characters, but as well what it means to us, having just endured our own round of gung-ho followed all-too-quickly by what-the-hell? Perhaps "What fresh hell?" is better. 'A Fine Summer's Day' works on many levels. By itself it is an effective mystery and vision of pre-war Britain. In concert with the rest of the series, it's immensely entertaining to see the before-war Rutledge. If you've not read the series, this might make a great place to start ... but the pleasure of seeing the shadow before the sun is quite considerable. With 'A Fine Summer's Day,' comfort reading and cognitive dissonance easily coexist, and declare a truce to end all truces. Inspector Ian Rutledge, just home from four years in the trenches of World War One, but not yet nearly recovered is the perfect target for Superintendant Bowles perfidy. A murder in Warwickshire looks to be a no-win case. The victim is a decorated officer from the war, and so is the chief suspect. That's not exactly what Bowles tells Rutledge, but the Inspector finds out soon enough. It's not his most pressing problem. That's likely to be the voice of Hamish McLeod, the soldier Rutledge executed in the darkest of his days during the war. Hamish lives on in Rutledge, chiding him, goading him, trying to drive Rutledge mad if he is not already. 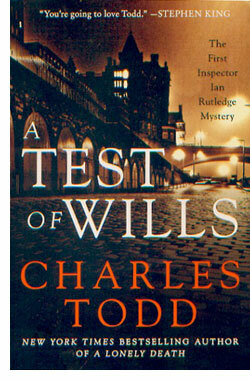 As an opener for what was to become a long-running series, 'A Test of Wills' has a lot going for it. Charles Todd's prose is evocative enough to craft the landscapes and characters, but never over-written. The pacing is lively, not frantic. The characters are crisp, easy to place and everyone is engaging in any scene. But 'A Test of Wills' has one thing that's not easily identifiable. Open this book up and the world goes away. 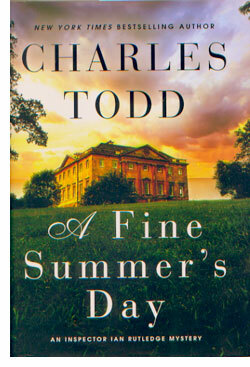 Charles Todd is a mother-son writing team of Charles and Caroline Todd, but you'll not guess it from reading the book. The collaboration is utterly seamless, and the results are so immersive that it's easy to miss the crafty intelligence that is at work here. The joys of historical fiction and mystery fiction are combined in such a way that the two play off of and strengthen one another. This is a very easy book to read, to like and to like to read. But beneath what seems simple is actually a very complex creation. It might seem that Hamish is a gimmick, but the writers are surprisingly capable of crafting Rutledge's "shell-shock" in a manner that plays out at one level only with what Rutledge could know, at the time, of his condition, while being informed at another level with all that we know of what's now called PTSD. Rutledge suffers in a variety of ways, some of which he is aware, and others of which he is unaware. The result is sophisticated character who reads with ease. The mystery itself is a nice twist on the classic village green plot, with the small town cast crafted vividly and memorably. Moreover, the plot feels organic, not programmatic. The authors take a page from literary fiction and use it without going over the top. Everything here feels nicely modulated. 'A Test of Wills' is a very nice start to this series. It's low-key and yet vivid, always smart, but never pleased with itself. Given that there are sixteen to follow, it's a great investment for readers who want to have a book at the ready. Ian Rutledge has served his country well, and he has the psychic scars to show for it. His service to readers is every bit as complex as that to his country. Yes, you will be whisked away, only to return with more than pleasant memories of great reading. You might find another voice in your mind, one that has less comforting thihngs to say about the world around you. It's easy to underestimate how much our perceptions of the world around us are based on knowledge unique to the 20th and 21st century. We've learned so much, so fast, and become such experts in disseminating this knowledge that we take it as an eternal given rather than a passing fad, or at the very least something new and very unusual. 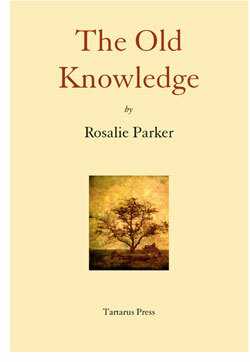 'The Old Knowledge' by Rosalie Parker is more than a set of formulas, or remedies or spells. It's a different way of being in this world. The stories to be found in this slim volume are chilling to be sure, and engrossing in every way. But there's a bigger picture than just the stories themselves. These stories take us not to a different world, but a different vision of this world. It turns out that how you see can break down the barriers between life and death, and not always in a manner conducive to the former. For all that, expect to find eight engrossing stories here, all in the mode of horror classics, with an original take informed by the author's work in archaeology and in publishing horror. In "The Rain," Geraldine, a thoroughly modern woman, decides upon a vacation in a more rural environment. "Spirit Solutions" looks into the world of high-tech afterlife encounters. I'd love to see more stories based around this group; they're fun and smart. "In the Garden" manages the neat trick of turning gardening into a setting for horror. "Chactonbury Ring" is a brooding piece of archeological surrealism, while "The Supply Teacher" manages to be an entirely new take on an old horror trope. It's funny and remarkable. The centerpiece of the book is "The Old Knowledge," another tale of city meeting country and archaeology that is delightfully full and rich. "The Cook's Story" takes us back to the garden, and "The Picture" is a nicely turned tale of haunting. I read this in EBook form, and found it a superbly presented piece of reading. To be sure, you can find first editions and reprints from Swan River Press scattered about. But you can esiy order the ebook direct from the publisher, a pretty damn amazing deal to get your foot in the Tartarus door. The upshot will likely find you seeking out their other work, and it is well worth finding. But Rosalie Parker's collection of stories will haunt you no matter where find them or how you read them. Human beings are a bickering species. But as much as we like to mix it up with one another, the majority of our arguments are entirely internal. We spend most of our lives interrogating and castigating ourselves, trying to find with certainty the answer to the question: who am I? 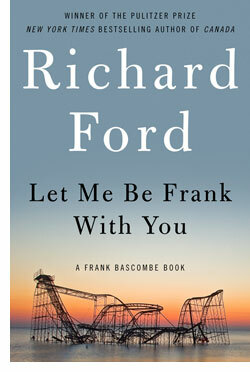 Richard Ford's iconic character Frank Bascombe has an answer or two for you, and Ford spells them out delightfully in Ford's latest book, 'Let Me Be Frank With You.' It's a collection of four novellas that reads very much like an episodic novel. It is Ford at the top of his game. 'Let Me Be Frank With You' is hilariously funny, cuttingly insightful, chock-a-block with stunning psychological wisdom, all while being entirely engaging and entertaining. The first story, "I'm Here," finds Frank retired and spending his time puttering around, reading to veterans and writing for their newsletter. His wife, Sally, is throwing most of her time into helping the victims of Hurricane Sandy, which has devastated the New Jersey coastline. Frank's managed to keep a bit of a distance, until a phone call brings back his past to haunt him. In "Everything Could Be Worse," Frank gets a visit from the former occupant of the house he now lives in. In "The New Normal," he goes to visit his first wife, who has just checked herself into a very expensive, upscale nursing home, having been recently diagnosed with Parkinson's. And in "The Deaths of Others," another phone call takes Frank to visit a friend he'd have preferred to have forgotten. This is a short book, but it is pristine in execution. Every sentence feels both natural and richly evocative of character or place. Ford's poetic prose rolls out lyrical descriptions of the American suburb laid to waste by the unstoppable power of nature. There is humor, high and low, the crisp clip of an everyday life turned into low-key and rip-snorting laughter. Ford's an easygoing master of great writing. Frank Bascombe himself is on a roll, having reached a new "period" in his life, that of the Default Self. In between acerbic observations that are deeply funny, expect to find insight into divining the self that has the ring of truth. Relationships between men and women, friends and ex-lovers feel familiar and warm but never fuzzy. And even though the book consists of four stories, Ford provides poetic prose, plot and thematic hooks leading from one to the other, so that the effect of reading the book is unified and richly satisfying. Each novella could work as a standalone piece, but together they offer a whole that is truly greater than the sum of the considerable parts. 'Let Me Be Frank with You' sneaks up on you. It's a fun, easy-to-read book that is incredibly substantial. Ford's vision of America is true to life, and Frank Bascombe's insights into life, the arguments he has with himself throughout the book, are quarrels that are ultimately won by and for the reader. And as much as we may be a bickering species, here's one point we can agree on; 'Let Me Be Frank With You' is perfectly clear vision of a very flawed race.